Microsoft Corporation India on Thursday announced a strategy aimed at supporting India's ministry of communication and IT in its efforts to address the issue of the digital divide in India. The announcement is the result of a series of in-depth discussions that took place this week at Microsoft's Redmond headquarters between a visiting Indian delegation led by Union Minister of Communications & IT, Dayanidhi Maran, and Bill Gates, Chairman and Chief Software Architect, Microsoft Corporation, and senior Microsoft executives including Will Poole, Senior Vice President. The discussions underscore Microsoft's commitment to partner with the ministry of communications & IT in seven strategic areas including driving PC penetration, accelerating IT literacy, ensuring affordable access to technology in rural areas, ushering in E-governance, enabling local language computing and creating a secure IT environment. 1. Broaden language availability for first time PC Users: Offer a multilingual Windows XP Starter Edition licensed and built exclusively for use in India and intended for speakers of any of nine Indian languages available who may also want to use English. The option of using English in addition to the Indian languages is being provided for the first time. The product has evolved based on customer and partner feedback and is designed to better meet the aspirational needs of Indian citizens, particularly first-time users. 2. Transform education instruction through ICT based learning: Microsoft will adopt 100 schools in 6 states initially to provide an interactive learning environment that, when combined with in-classroom PC's and projectors, would provide an engaging and transformational learning experience for students in their local language. The intention is to roll out across the country based on the experience gained. 3. Ensure affordable access to technology in rural areas: Microsoft would support the programme of the Ministry of Communications & IT to establish 100,000 rural kiosks by offering a range of affordable products, services, consultancy, training and support. 4. Offer special package in collaboration with partners to deliver a broadband and PC package, especially for first time users, at an affordable monthly installment to support India's broadband strategy. This would be in partnership with companies such as BSNL, MTNL, HCL, HP, SBI, ICICI and others. Microsoft would also make available its education content under this programme. 5. Facilitate adoption of e-government: Microsoft will set up an E-governance Center of Excellence along with an Indian institution and commit funding of $2 million over three years for pilots of IT applications. The centre will be guided by an advisory body of eminent people. Microsoft will also share its knowledge and experiences in working with governments across the world on E-Governance projects. 6. Enable local language computing: Microsoft intends to collaborate with Govt. of India agencies including C-DAC and the Indian scientific community to conduct research in Indic language computing technologies. A suitable institutional framework in this regard will be explored. 7. Create a more secure IT environment: Microsoft and Computer Emergency Response Team (CERT-In) set up by Department of IT will cooperate through a Security Cooperation Programme (SCP) to create a more secure computing environment in India. "Today's announcements by Microsoft including the launch of a new multilingual Windows XP Starter Edition for India, are steps in the right direction. The various steps announced today address important issues like IT literacy, taking high-quality, interactive IT education to schools in India, availability of local language computing solutions and e-governance," said Dayanidhi Maran. "There is an urgent need to enable affordable access to locally relevant IT applications at a broad level. 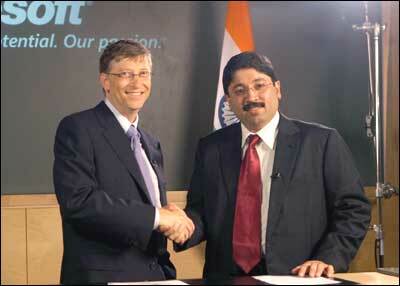 I believe that through effective private-government partnerships we can deliver on this objective," Maran added. On the occasion, Bill Gates said: "We are delighted to be working with Mr Maran towards our common goal of bridging the digital divide for people across India. In particular, I'm excited about the promotion of e-governance technologies, the expansion of teacher education and broadening our Windows XP Starter Edition for India offering to better meet the needs of Indian citizens." "India is synonymous with IT success today. As a long-term partner for India, Microsoft strives to be a key contributor to this success and at the same time help create a digitally-inclusive society where technology reaches out to the over one billion strong population to help them to realize their full potential," said Ravi Venkatesan, Chairman, Microsoft Corporation India Pvt. Ltd.
"We seek to work closely with the government to help realise this vision. The meeting with Mr Maran's delegation has been extremely constructive, enabling us to develop a conclusive collaborative strategy for leveraging IT to make a positive impact at the grass root level."